Check limits the values that are accepted by one or more columns. The Below code accepts only values A or k or R or S, it will not accept other than this. What happens if we insert other than this? The INSERT statement conflicted with the CHECK constraint "CK__CHEECK__SHORT__607251E5". The conflict occurred in database "Rohan", table "dbo.CHEECK", column 'SHORT'. If there is no value the column accepts Null Values, even though there is Check Constraint. Check Constraints works at the row level, checks whether the row is true, if there is no row for check column it will take default NULL values. 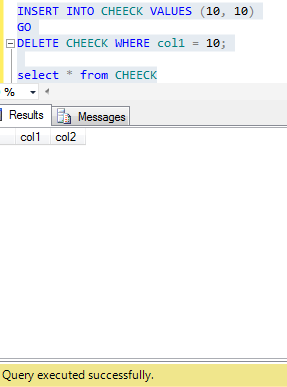 ONLY EMPTY TABLE RETURNS, Even though the check constraint says the count of the table should be greater than 1.